A collection of short stories featuring the redoubtable 'heart specialist', Parker Pyne. This volume, in its contemporary Agatha Christie Collection livery, perfectly illustrates Agatha Christie's critically-acclaimed foray into light-hearted, romantic mysteries. Mrs Packington felt alone, helpless and utterly forlorn. But her life changed when she stumbled upon an advertisement in The Times which read: 'ARE YOU HAPPY? IF NOT, CONSULT MR PARKER PYNE'. 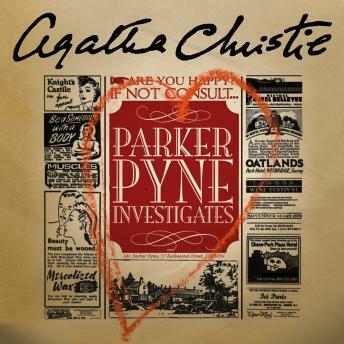 Equally adept at putting together the pieces of a marriage or the fragments of a murder mystery, Mr Parker Pyne was possibly the world's most unconventional private eye - and certainly its most charming.